Daylight Savings Time begins (US) - remember to set your clock forward. Our "Virtual Sunday Church" today is a favorite service hymn, sung by a pretty good choir! So he said, "I am Abraham's servant. The Lord has greatly blessed my master, and he has become great. He has given him flocks and herds, silver and gold, male servants and female servants, camels and donkeys. And Sarah my master's wife bore a son to my master when she was old, and to him he has given all that he has. "Before I had finished speaking in my heart, behold, Rebekah came out with her water jar on her shoulder, and she went down to the spring and drew water. I said to her, 'Please let me drink.' She quickly let down her jar from her shoulder and said, 'Drink, and I will give your camels drink also.' So I drank, and she gave the camels drink also. Then I asked her, 'Whose daughter are you?' She said, 'The daughter of Bethuel, Nahor's son, whom Milcah bore to him.' So I put the ring on her nose and the bracelets on her arms. Then I bowed my head and worshiped the Lord and blessed the Lord, the God of my master Abraham, who had led me by the right way to take the daughter of my master's kinsman for his son. Today's passage is just a recap of what has gone before, as Abraham's servant explains the reason for his actions of yesterday to Laban, Rebekah's brother. If you have missed a day, you might do well to read the Scripture from one of the last few days. Rebekka at the Source, by Antonio Bellucci, ca. 1700. Bellucci, primarily a religious painter, adds a touch of rococo naughtiness to his depiction of Rebekah. 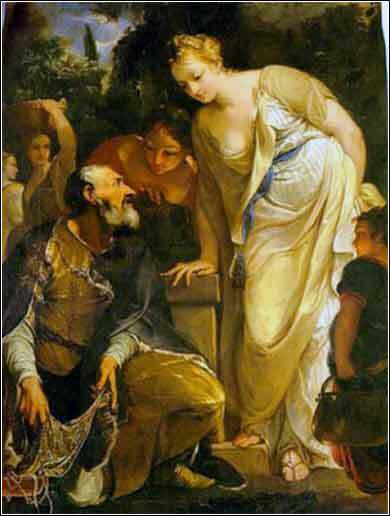 He captures the moment when her interest is piqued by all the gold the servant is offering her. Like the wonderful Tissot painting of Rebekah, he depicts her with a touch of carnality, although here she appears European, with a very Baroque voluptuousness.